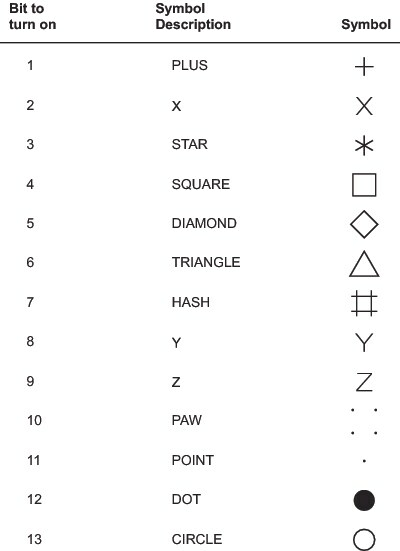 Specifies which symbols can be generated by hardware. is a hexadecimal string that is 16 characters long and must be completely filled. This table shows which bit position (left-to-right) within the hexadecimal string controls each hardware symbol. For example, if you want the driver to do only the PLUS and X symbols in hardware, the first and second bits of the first byte of the hexadecimal string should be turned on, which would correspond to a value of 'C000000000000000'X ('C0'X is equivalent to '1 1 0 0 0 0 0 0' in binary). These are not the only symbols that can be generated for graphics output but are the symbols that can be drawn by the hardware. SAS/GRAPH can draw other symbols. Note: Not all devices are capable of drawing every symbol. If a particular hardware symbol is not available or not to be used (as indicated by the value of SYMBOLS), the symbol is generated by the software. If the value of the SYMBOL device parameter in the device entry is N or the NOSYMBOL graphics option is used, the value of SYMBOLS is ignored.